Art is in the blood of a human and this is why it never dies even when all the technology and modern stuff is out on the verge. To hone your skills as an artist, the equipment such as brushes and pencils you are using must be of high quality. To bring the better colors for your drawing, we are counting down our picks for Top 10 Best Colored Pencil Sets 2019. 1 How to Find the Best Colour Pencils? How to Find the Best Colour Pencils? Firstly, there is no such thing as a universal ‘best’ color pencil set since the best differs from one person to another. It is quite up to your personal preferences and the kind of art you are going to make with the pencils. You can find soft pencils, hard pencils and similarly, there are pencils according to the kind of paper you are drawing on. If you want to go for more detailed drawing, you should invest in hard pencils while soft ones are for those who want more opaque layers in their drawing. Color pencils may also be water based, oil based or wax based. Wax-based color pencils are softer than the other two and their coverage and color is also more intense and larger. If you are looking for durable pencils, wax based ones are not a good idea since they can easily break or wear out. In this case, oil-based pencils are a good choice since they are more durable. Water-based color pencils can be used either wet or dry so you can get the texture you want. Also, if you are a beginner, go for cheaper color pencils while you are learning and then slowly upgrade to the premium ones. 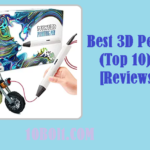 Recommended: Check out our list of 10 best 3d pens of 2019 here. 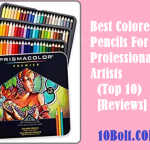 So, here is our list of 10 Best Colored Pencil Sets 2019 along with reviews, features and pros and cons etc. You can either checkout our comparison table or go directory for the reviews in case if you wanna research in depth. Good for both the professionals and beginners who have just started painting. All the leads in this set are centralized perfectly for the quality performance. This is a waterproof product which is based completely on oil. Its pencils are slightly heavier for younger people. Faber Castell is a huge name in the art supplies industry so it is only fair that one of their products tops this list. These color pencils offer a wide range of colors so you can pretty much get any shade you want. Since these are oil-based, they are also quite durable. Despite being strong, the color pencils have a soft feel to them. The final result is thick and pigment and the colors are easy to work with. All colors are quite true to appearance and the outer color is what you will get on paper too. You can make the colors intense with application and blending. Being an oil based pencil set, these colors are better blended when a thinner is used. However, this is not necessary. If you want to be an expert in the shadow work and shading, these are perfect ones. Designed in a way that each color in the set can deliver multiple shades. Made of strong quality material, these aren’t going to break ever. A lightweight colored pencil of fewer than 3 pounds. Prisma Colour Premier color pencils are also quite awesome in terms of design and color variety. To get a smooth result with these pencils, you have to keep your pressure lighter. If you do that, you will get wonderful layering with these color pencils. The colors have a buttery core so they are easily blended and they appear creamy and quite sleek on paper. Gamsol can also be used with these pencils as it goes quite well with them. Even though it might dull the color, it can help in blending. These color pencils can also be used for creating gradients. All you need is a blending pencil and any color from the set. One of the problems with this set is wax blooms that appear after a few layers. Using the metal extender, you can increase the holding size. According to the shape of these pencils, their barrels are designed in the hexagonal shape. A good quality eraser is attached with each pencil to erase the mistakes made. Good for drawing in the school and at your home. If your kids are interested in drawing and you want to get him or her a first pencil color set, then this is the one. The Jazmine pencil color set has 48 high-quality colors and your child will have plenty of shades to choose from. There is no repetition and all colors are different. The set also has a portable Canvas art case so that your child can organize the pencils and accessories neatly and easily. There is also a metal pencil extender that will keep the pencils going for long. It helps in extending the working life of pencils that are almost used up. To make this set complete, the company has also included an eraser and sharpener in this pencil color set. So, your child can start his or her drawing journey with a complete set of colors with accessories. Not a single toxic material is used in the making of this set. 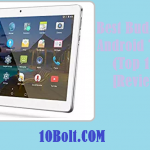 Though most people think of it as expensive, it is still quite budget-friendly for its quality. One of the best pencil sets for artists. A lightweight pencil set which is also good for younger artists. Imaginesty IM color pencils set is useful for younger artists as well as adults. An important feature of these pencils is the complete absence of any toxic components. Even though the company says that these color pencils are for artists, they really are not. The company makes quite a lot of claims but the product does not really live up to them. When compared with a cheaper set of color pencils, Imaginesty failed to compete with it in terms of intensity and color vibrancy. These color pencils do not blend well and they are not as intense as other brands. Also, even after several layers, you would not get a good intensity. There are no names for the colors as they are just indicated by the color of the exterior. These colors are also not completely accurate so you will be disappointed. Faber-Castell 110024 is an oil-based pencil set good to work at any surface. This product is known for its smooth user experience while painting. Sharpen these as much as you want and they aren’t going to break. Only a small amount of pressure is required to make them work. The Faber Castell color pencils provide a smooth and enriching experience to the users. These are recognized internationally by professional arts. Since they are high-quality color pencils, they can be used for freestyle drawing or for graphics. The colors are highly pigmented and they easily show on paper without you having to apply much pressure. The Faber Castell pencils are oil based so you can sharpen them as much as you want without worrying about breakage. They are also smudge-proof and have a thick lead that is water-proof. Since there is SV bonding in the pencils, they are break-resistant. In a tin, you will find 24 pencils. To keep everything safe, the company has made the leads acid-free. Though not for professionals, it still has a touch of professional features. One of the best features is the mixing ability of this set. In this one set, there are different types of pencil colors. A set of 150 pencils at a price anyone can afford. The Thornton’s color pencils come in a set of 150 pieces so you can imagine the color variety that you will find in it. These pencils can be used for sketching and drawing. Whether you want to use them for casual coloring or you are a budding artist who is still learning, these pencils will not disappoint. This is a Premium set so it has soft core pencils, charcoal pencils, neon pencils, and water-soluble ones. Also, there are sketching pencils in the set too. The color pencils allow you to get the right intensity and highlights since they are pretty vibrant and blend smoothly. You will be able to get defined results with this pencil set since there will be no scratches on your paper. When you buy the set, it comes in a canvas bag so you can carry around your supplies if you are in a mood for some outdoor art. Each pencil is safely contained in its little compartment so that it is not worn out over time. These color pencils are quite compatible with the intensity of touch and go from sheer to opaque easily. These Derwent Coloursoft colored pencils are perfect for art like blending. Another thing which you can do nicely with these is the color graduation. However, if you want to work on skin tones, these wouldn’t be better. A set also good for working on landscapes. Derwent Coloursoft color pencils come in a pack of 72 pencils and they are quite widely trusted around the globe. The colors are rich and creamy. When you use them, you will be able to experience the ease with which the colors blend on paper. The core is buttery and rich while being strong. Since the pencils are break-resistant, you can sharpen them to a perfect edge that you want. The color pencils have a 4mm softcore and they can work on any drawing surface. The colors produced by these pencils are rich, bold and quite dense. With the velvet core, you will be able to build up color and create a gradient. The sharp and fine tip allows you to get precision in your drawings. The colors easily blend ale so you can blend different colors together to get the shade you want. In a very cheap price, you get a colored pencil set with professional features. A product which is only made perfect beginners and youngsters. The low-quality crayons are used in the making which would be the only con. The lead used in these pencils is long-lasting. This Art set has a lot of options to choose from and you will find whatever you need in this box. The whole set can be easily carried around as every color pencil is in its compartment. It has 24 premium color pencils with a rich core. These pencils may be used by beginners or experts. Their appearance on paper is quite smooth and pigmented. As you change the pressure on the pencil, the color intensity and opacity will very easily. You can also blend the colors together easily to get a wide range of shades. The whole set has 142 art pieces so there is something for everyone. There are 24 oil pastels in the set and 60 crayons of different colors. Also, there are sketch pencils in this set so that you can get precisely sketched drawings. Moreover, there are 24 watercolors in the set if you are in the mood for painting. Depending on the budget range you have, you can between 12 and 105 pencils. As for the color tones, they are quite professional especially if you get more pencils. Not good for shading since there are some shades missing. These colored pencils are rated quite average by the experts. Lyra Rembrandt Polycolour color pencils are oil-based and they have many beneficial elements. Firstly, let’s talk about the choice of colors. The variety of colors depends on the box that you go with. There is a 72 color box and a 105 color box. These two have most colors while the 36 piece set lacks some shades of red and purple. The round and soft 4mm core allow for easy application and good blending. The price range is high but not too high for the quality. The final output of these color pencils is quite close to that of the higher end brands such as Faber Castell. You will see the good intensity and rich color in the paper. 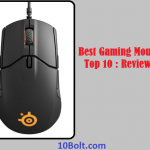 However, you need to apply a little more pressure as compared to other brands. The pencils in Castle Art Supplies Premium are quite soft which makes them good for layering. Also, doesn’t matter which combination you can think of, it would be possible to achieve. A product which shows you the right path to success. The whole pack is just 1.6 pounds. If you are looking for an art supplies set that is affordable yet delivers, the Castle Art set is good for you. There are 72 pieces in a set and these pencils give you a wide range of colors to choose from. This set will be suitable for the needs of most artists. One of the prominent features of this set is the tan and brown colors that are ideal for making skin tones and furs. The oil-based finish gives a nice blend to the colors but you may experience some wax bloom. The problem with this set is that the brighter colors will not deliver much. Also, their color intensity is not that great. Especially, the yellow and orange colors need several applications to get the desired colors. Another issue that users may have is that the external shell of the color pencils does not match with the color on the inside. So, it is better to make a color wheel for yourself on a separate sheet of paper to get a better idea of the color that you will get. Despite all of this, the Castle color pencils are good value for the price.